Cricket Ireland and Sussex have confirmed they will meet in a one-off T20 match at Arundel Castle this summer. The fixture has been arranged to honour the long-service and career achievements of Dublin-born Ed Joyce in his testimonial year. A Sussex team and an XI from Ireland will lock horns at Arundel on Sunday, June 24. The match is part of the Ed Joyce Testimonial Year programme, an honour bestowed on him by Sussex Cricket to recognise his service to the county side that he played for from 2009 to 2016, and captained from mid-2012 to 2015. “Ed has been a fantastic servant to Irish cricket since his arrival on the international scene in 2006. Not only is he a one of the most talented and hard-working batsman we have ever seen pull on the Irish shirt, he is a great ambassador for the sport off the field,” said Richard Holdsworth, Cricket Ireland performance director. Rob Andrew, Sussex Cricket chief executive, added: “We’re absolutely delighted to be able to support Ed’s testimonial by taking part in this historic T20 in the beautiful setting of the Arundel Castle ground. “Thanks to his performances as a batsman and leadership as captain, Ed is quite rightly regarded as a Sussex legend. This match will be a fitting way for the club’s supporters to celebrate Ed’s achievements and help raise money for the PCA Benevolent Fund and Sussex Cricket Foundation, the two charities Ed has chosen to support through his testimonial. 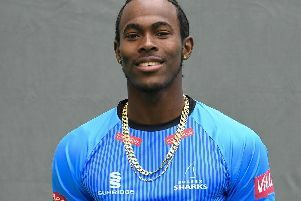 “The match will also provide the team with a perfect opportunity to test their T20 skills against high quality opposition less than two weeks before the start of this year’s Vitality Blast. “It’s brilliant, also, to be able to bring a T20 match to Arundel in 2018 after all." Sussex's clash with Ireland will follow on from their Specsavers County Championship match against Durham at the same venue the week previous..
Joyce, currently on tour as part of Ireland’s campaign to qualify for the Cricket World Cup in 2019, said he was honoured to be recognised in this way and looked forward to leading out an Irish XI against Sussex. “I definitely played my best cricket at Sussex and am very grateful to all the players, coaches and supporters who firstly welcomed me to the club, and then also helped bring the best out of my game,” said Joyce. Tickets for the match are available online now. Full details of Ed’s testimonial year are available at http://edjoyce2018.co.uk/. The opening lunch takes place on Friday, April 6 at The Grand Hotel, Brighton, with tickets available here.